Looking forward to our first outdoor show of the year at https://laketownrock.com on Sunday, May 21st. 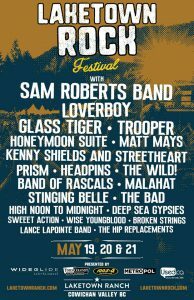 A three day festival featuring some of the very best in Canadian R&R. We are most grateful to everyone at Laketown for including us in this years lineup and, we look forward to seeing many of our BC fans, who we never see enough of! Hope you all have a fantastic weekend whatever you plans are. Be safe on the roads out there chums!